Making sacrifices has been part of walker V. Subramaniam life till today and will continue to do so because walking is his life. Subra as he was more popularly known, was a keen sportsman as a youngster and played football and other sports, but had a fascination for walking. He had won his first walking race in 1969 in a 10km race and went on to finish second in two others. But working with a private company, he was not giving time-off for training or competition and had to put his ambition to be a national athlete on hold. 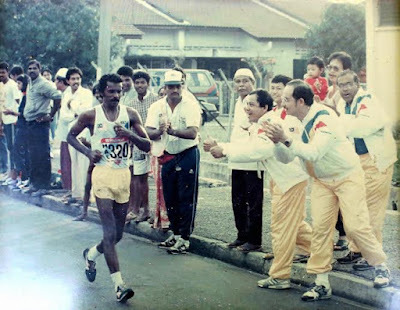 It was only ten years later at the ripe age of 26, when he found employment with Telekoms Malaysia in 1975, with whom he retired after 30 years that his athletics career finally took off. With support from his employers, Subra saw his 14 years walking career take off with wins in almost all walking tournaments like the Malay Mail Big Walk, State meets and a walking circuit organised by a private company, Wings, before competing in his first international competition – in the 1977 Sea Games in Kuala Lumpur where he won the 10km gold medal and 20km silver medal. He went on to win six gold medals and five silvers in five Sea Games. He qualified for the 1980 Moscow Olympics Games, but had to skip it because of the boycott by Malaysia. He has competed in the 1978 Edmonton Commonwealth Games where he finished 12th, 1978 Bangkok Asian Games where he settled for the silver medal and 1982 Games finishing fourth and two bronze medals from the Asian Track and Field in 1979 and 1981. In overseas international championships he has won he Dusseldorf in 1982 and Perth Open 10km walks in 1983. He was named Selangor Sportsman for two consecutive years – 1978 and 1979 – and was also named the National Sportsman of the Year in 1978. But every step of his walk had seen Subra who turned 66 on May 11th, make sacrifices and anyone else in his shoes would have long ago given up. But not the father of three boys (late Saravanan, Rajinikanth (40) and Sundhar (37) and two girls Uma Sunthary (40) and Shanti (38). Even the death of his oldest 21-year-old son Saravanan in 1992 after a motorcycle accident, did not see Subra hang up his walking shoes. Saravanan was doing electronic studies when he passed away. “It was the saddest moment in my life because having to do the rites for his own son is the hardest. No father should experience that moment,” said Subra with tears welling in his eyes. “But life had to go on and I had four other children I had to look after and my wife’s health was also deteriorating. “I was already active in coaching after my retirement from competitive walking and was producing national walkers,” said Subra a walks coach with the National Sports Council. Among the walkers whom he had nurtured include Annastasia Karen Raj, Mohd Shahrulhaizy Abdul Rahman, Narinder Singh, Loo Choon Sieng, and 2015 Sea Games bronze medallist Khairul Harith Harun to name a few. The Sentul-born Annastasia, was a runner whom Subra discovered while conducting his trainings at Lake Garden and asked her to switch to walking. And through Annastasia, Subra somewhat made up for his disappointment of missing the Moscow Oympics, when the former at 21 became the became the first woman walker from Malaysia to qualify for the 1996 Atlanta Olympic Games, where she finished a creditable 24th out of 46 qualifiers with a national record of 45:47.00 in the 10km race. She had rewrote the national record 13 times in four years. Annastasia is among many of the national walkers who paid tribute to Subra for their success. He’s a real taskmaster,” she had said. But no one cannot question’s Subra’s dedication to the sport and bringing the best out of his walkers. During one centralised training in Bangi, Annastasia was at the running track in the wee hours of morning when it began to rain. While others took cover, Subra took out an umbrella, held a stopwatch and asked Annastasia to continue. She walked and walked ... all drenched and cold. And no one could see the tears rolling down her cheeks. A month later, Annastasia took part in the Philippines Open. It rained and, guess what, she won. And more recently for the Singapore Sea Games, Subra who was not in the official contingent for the Games, made a day trip to the Republic to give charge Khairul Harith Harun some motivational words which saw him win the bronze medal in the 20km walk. He returned immediately after the race. “I train Khairul and he having missed the medal at the last Sea Games as he was disqualified close to the finishing line, he needed some encouragement. Besides, he had been injured with a hamstring injury and has not walked on the road for a month,” said Subra who had taken the express bus in the morning and arrived an hour before the race at 4pm. “It was through treatment with ISN that he had recovered considerably, but was still not 100 percent recovered. “But I believed he was still good for a medal and felt that my presence will help him,” said Subra. Subra’s 66-year-old Krisranee has to undergo dialysis three times a week and he has to take her for the treatment. But he still managed to find some time for Khairul and that speaks volumes for his dedication. Subra’s daily routine sees him get early in the morning to conduct trainings before returning home to attend to his wife’s and also prepare lunch for his grandchildren who live close by come to his house. Then leaves for the afternoon session before returning home at night. “This is my life and I have no complains. Walks is my life. What will I do without it? I may have been making sacrificing all my life for the sports, but that is what I love,” said Subra if he was tired of his routine. On his worst moment through his trials and tribulations, he said there was two. 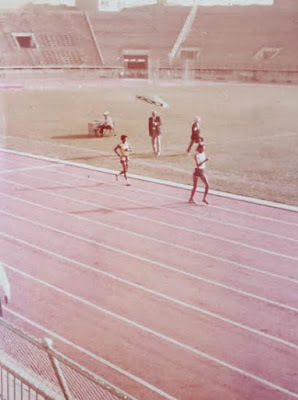 “One was when my eldest son passed away and the second was on the field of competition when in the 1978 Bangkok Asian Games, India’s Hakam Singh run past me to win the gold close to the finishing line. Both his knees were bent and that is running,” said a disappointed Subra. On his happiest moment, he also replied he has two. Subra said that he will continue to help nurture more walker for as long as he is fit do so. “I may have to juggle my time between taking care of my wife and sports, but I cannot think of doing anything else,” said Subra who has two titles, AMN in 1988 from the Agong then and Johan Mahkota Wilayah in 2013. The next title in line is a Datukship, but Subra said his biggest honour is that he is still healthy, fit and contributing to the nation as coach. Subra also had the honour of being named the Coach of the Year in 1996. A simple man indeed, but one who has contributed so much to walking through sheer passion and dedication. Few can step into his shoes.